Figure 1: Three-dimensional false-colour renderings of a human cerebellum, obtained with X-ray grating interferometric phase-contrast tomography. 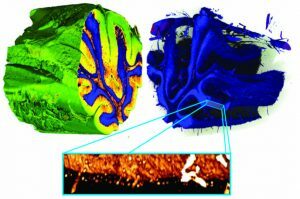 White matter (orange) can be distinguished from two types of grey matter (blue: stratum granulosum; yellow: stratum moleculare). The data also show blood vessels and individual cells identified as Purkinje cells (detail inset at bottom of figure). With help from CERN, some 700 Swiss primary-school children from the Geneva area tried out the scientific method for themselves this year. On 26 January 2011, 30 local primary-school teachers met at the site of the LHCb experiment for the launch of the ‘Dans la peau d’un chercheur’ (‘Be a scientist for a day’) project, a joint activity by CERN, PhysiScope (University of Geneva) and the local education authorities in the Pays de Gex and the Canton of Geneva. 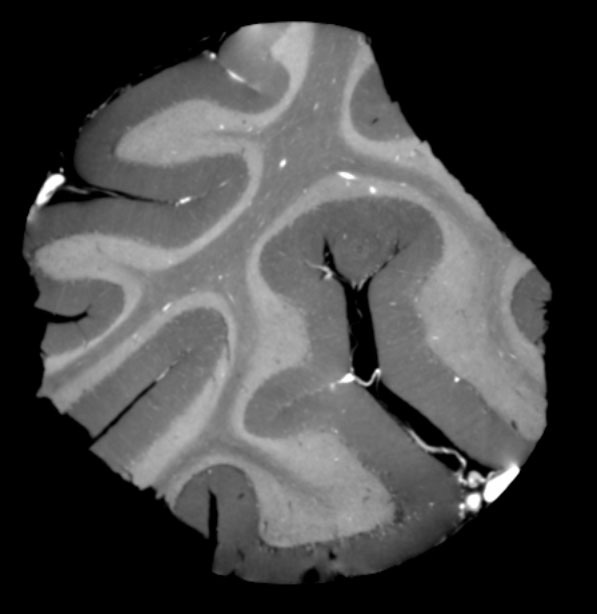 Figure 2: A single tomographic slice from the phase-contrast tomography dataset. From February to June 2011, children aged 9-12 carried out their own investigations to try to discover what is inside a mystery box, just like CERN scientists attempting to detect particles which cannot be seen with the naked eye. The pupils began by designing and carrying out experiments, after which they could compare their ideas and send questions to CERN scientists via the project website. In April and May, they even got to visit a CERN experiment or take part in a PhysiScope event – a chance to grill the physicists about their own experimental methods. Finally, the children gave a lecture of their own, just like real scientists do.